The end of our Delmarva excursion came all too soon. Amidst the frenzy of clean-up activity before we all deported for the north, we had time for only a brief last look at the birds in the area. We bid farewell to the starlings, sparrows, swallows, and seabirds that crossed the skies above the house. We acknowledged the pair of Brown Thrashers that had been trying to catch our attention all morning with their freaky cries. We looked for some of the birds that escaped us like Dunlin and Black Skimmer, but all too soon, it was time to hit the road. Since we found ourselves making phenomenal time, we allowed a brief detour to check out another enticing wildlife refuge. Bombay Hook National Wildlife Refuge is the best thing I’ve ever seen in Delaware. It’s actually worth the tolls! We knew that Bombay Hook would be special when our first new bird of the day appeared by our car as soon as we pulled in. Three Northern Bobwhite, not quite a covey, gave us a few seconds to admire them before they vanished into the grass. Most of the refuge was closed to the public so that hunters could terrorize the waterfowl. That wasn’t a big deal since we didn’t have much time anyway. We tried an observation tower overlooking Raymond Pool, which yielded us yet another Northern Harrier. Mainly, the tower revealed that we’d be much better off on the road. We didn’t have to drive much further before we hit birding paydirt. Jamaica Bay National Wildlife Refuge stands out as one of the most superior birding spots on the East Coast. What impressed me most about Bombay Hook was how different its species seemed from Jamaica Bay. Of course, there were the countless sandpiper-like birds that we could not identify as well as the smattering of expert birders, scopes at the ready, that could. But the birds themselves just seemed different. 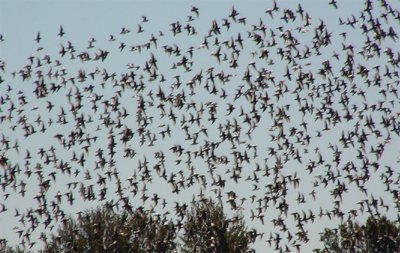 Lesser Yellowlegs whirled about in tremendous flocks. Canada Geese kept to themselves. There were only a few ducks, most notably a flock of Northern Pintail in drab plumage. Even egrets and herons kept a lower profile than usual. 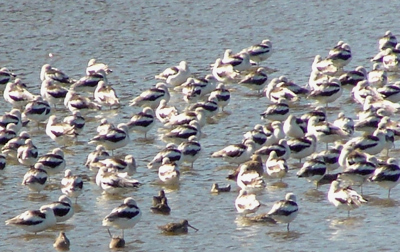 Most of the action here revolved around a large group of American Avocet in the center of the pool. These long-legged waders, all black and white with their astonishingly thin upturned bills, were beautiful. As if they weren’t enough to draw the eye, their flock hid some exciting surprises. We love going to popular birding sites because we can usually count on encountering some experts. We’ve said it before and we’ll say it again: we’re not that good at this yet. We need help. Our optics are deficient and our eyes untrained. Bombay Hook is good enough to draw the types of birders we love, the ones who can tell a Hudsonian Godwit from a Marbled Godwit. Both of these rarities were mingled with the avocets, and a kind birder not only identified them for us, but let us see each one through her scope. We always appreciate that kind of treatment on the trail. On our way out, we spied massive flocks of Snow Goose through the trees resting in another pool. We resisted the temptation to spend another hour looking at them because we had to hit the road. We’re lucky we did, because we hit hellish traffic on the NJ Turnpike. What else is new? The Delmarva trip was really enjoyable. As far as birding goes, our identification skills were not at their peak. We left a lot of birds on the table. We saw plenty of sparrows, warblers, even juncos, that we could not positively ID. An orange eyebrow here, a white eye ring there, and we are thrown. However, we had a great time and even learned a trick or two. We definitely have a long way to go, but we have plenty of time! can you tell me for each month of the year what kind of birds visit bombay hook please? Where Are You Birding This Second Weekend of February 2012?